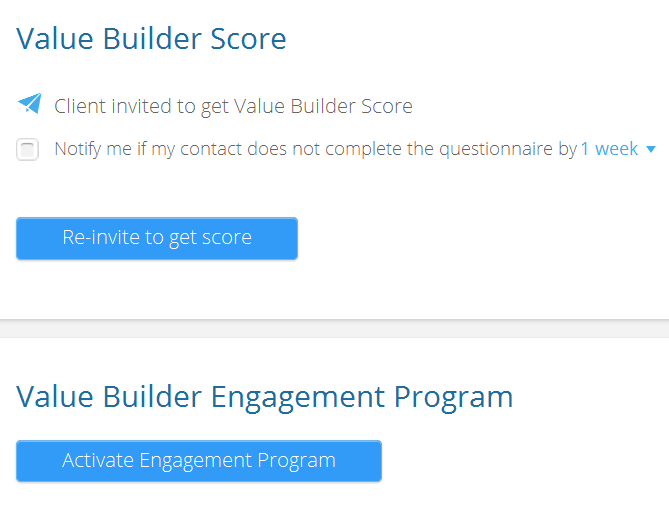 When you enroll in and complete your value builder certification, you will have access to a powerful set of tools to engage your clients in helping them grow their business and to increase your client base. 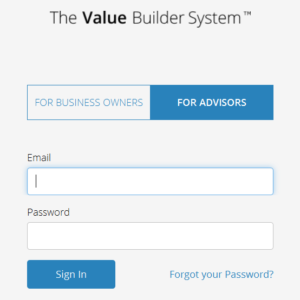 The Value Builder Certification & System is designed with you as the advisor in mind. You will have the Professional Credentials your clients are seeking in a business advisor, which creates a relationship of trust, ultimately giving you a regular, recurring revenue stream into your business. More than simply reporting on the real value of your clients’ business, through our 12 unique tools you are in the best position to advise them in proactively building their value. You will also have access to research and marketing materials to help the growth of your clients’ business and your value-building practice. Click here to see what other advisors are saying about earning their Certified Value Builder designation. 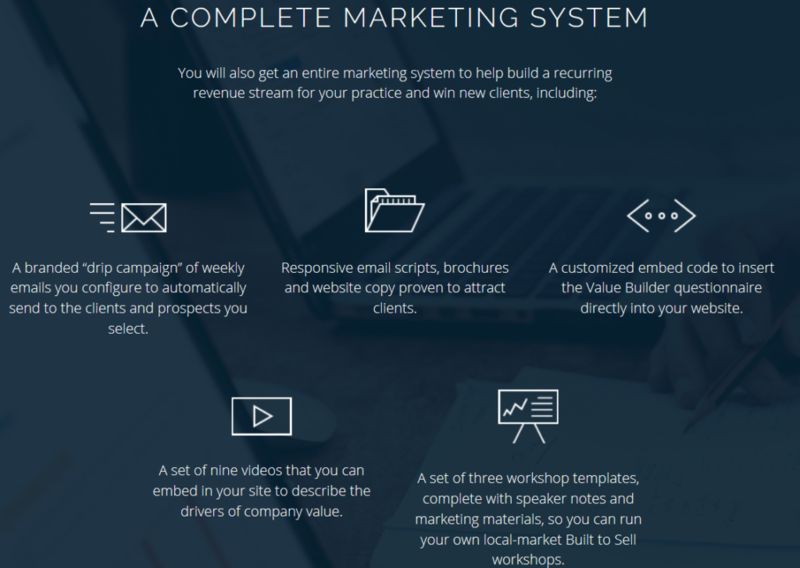 As you work to grow your value-building practice, you will have access to a full marketing system to help you every step of the way as you build your recurring revenue stream. You will have access to branded “drip campaign” email systems to regularly and automatically contact your clients and leads as well as email, brochure and website formats proven to attract clients. With 3 different workshop templates, you can easily run your own local workshops for business owners in your area, complete with speaker notes and marketing materials. 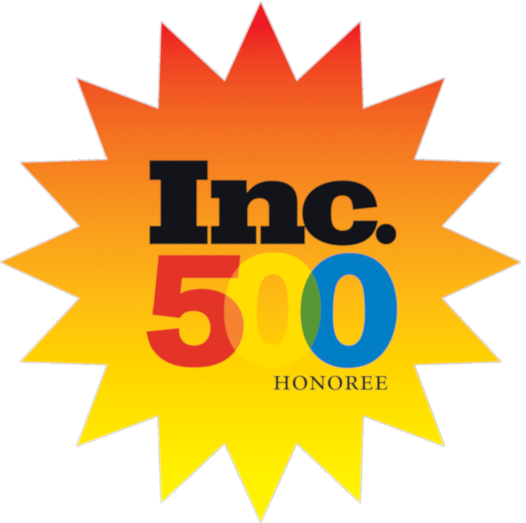 This will allow you to reach out to an even greater contact pool to increase your client base at an increased rate. 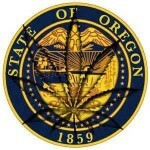 From there you will have access to all of the tools you will need. Your main tools are found on the above tool bar: your Dashboard, Contacts, Team, Events, Learning Center and Marketing Assets. Your Dashboard has various customizable reports to give you an overview of your Value Builder practice, leads and clients. You can access the information and status of all of your clients and contacts under the Contacts tab. Here you can see their name, email, company, the status of their score(invited, incomplete, or their Value Builder Score), the date of their last activity, and their assigned advisor (if you have more than one on your team). When you make a new contact, you can click on the add contact button near the top right of the page (bottom right in the above graphic) to add your new lead into the system to allow for easy tracking of their progress. Simply fill in their information in the fields as shown to the right and click ‘add contact’. 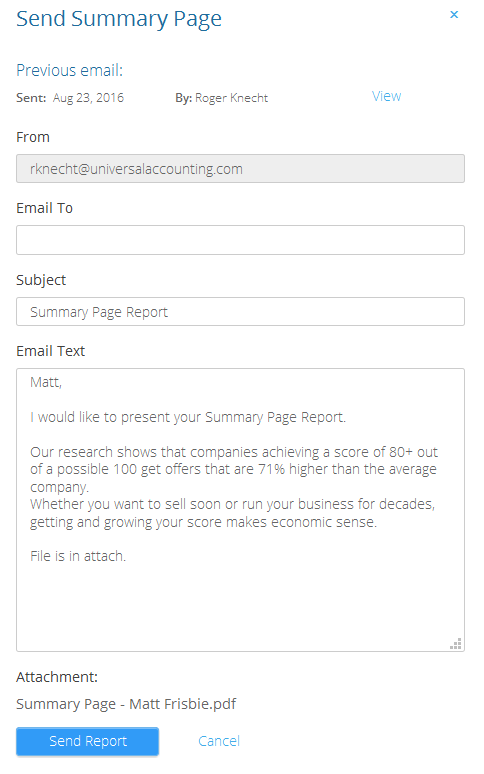 Once a contact is added, you can invite/re-invite them to take the evaluation, receive a notification if they have not taken the evaluation, view their score once they have completed the evaluation, see and send the various reports for their score, along with other functions to best assist you in advising your clients. 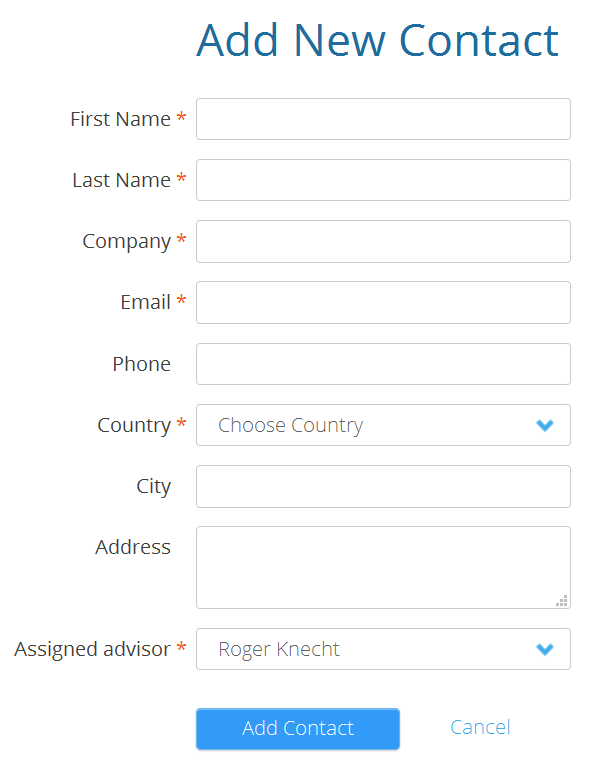 Under the Team tab, you can manage your team of advisors in matters such as their contacts, statistics regarding their contacts, and adjusting their permissions. 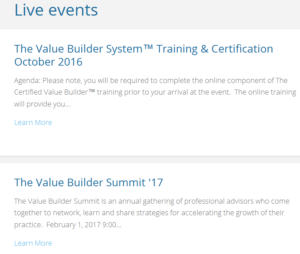 Under the Events tab, you have access to purchase tickets to live events, trainings and conferences to help you increase your success as a value builder advisor. 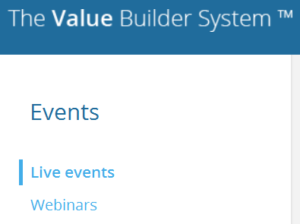 You also have access to register for upcoming webinars or view past webinars hosted by Value Builder to assist you even more in leveraging the value builder tools and system in the growth of your practice and your clients’ business. 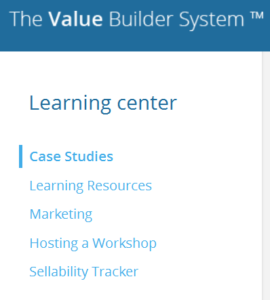 Through the Learning Center tab, you will find various tools to assist you in your career as a Value Builder. You will have access to interviews and case studies in regards the success of other advisors and the growth of their clients’ business. The Learning Resources, Marketing, and Hosting a Workshop sections of this tab will coach you in using the tools provided and the team you have at your disposal to maximize your success as an advisor through effective marketing, engagement of contacts and workshops. The Sellability Tracker section of this tab will continue to give you updated research provided by the value builder system about the value of businesses in your clients industries as well as changes to the average offer businesses are receiving for the sale of their business. 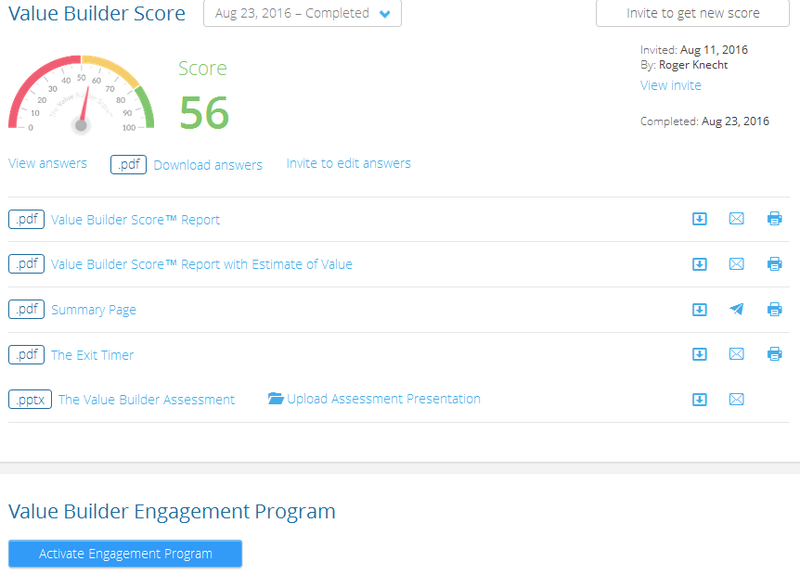 Also, under the marketing assets, you will find all of the marketing tools that come with your certification as a Value Builder Advisor to allow you to be successful in your practice. 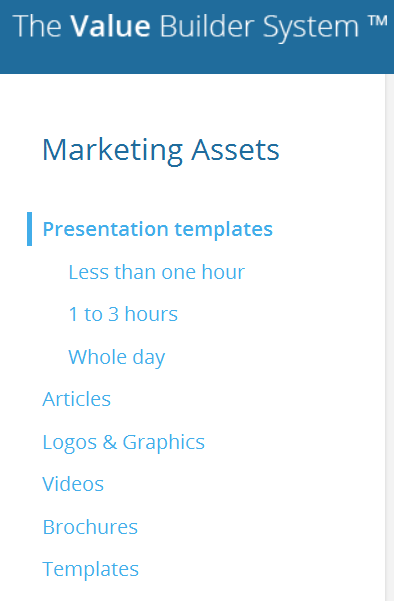 Here you will find the 3 workshop presentation templates, based on the length of the workshop you would like to offer. 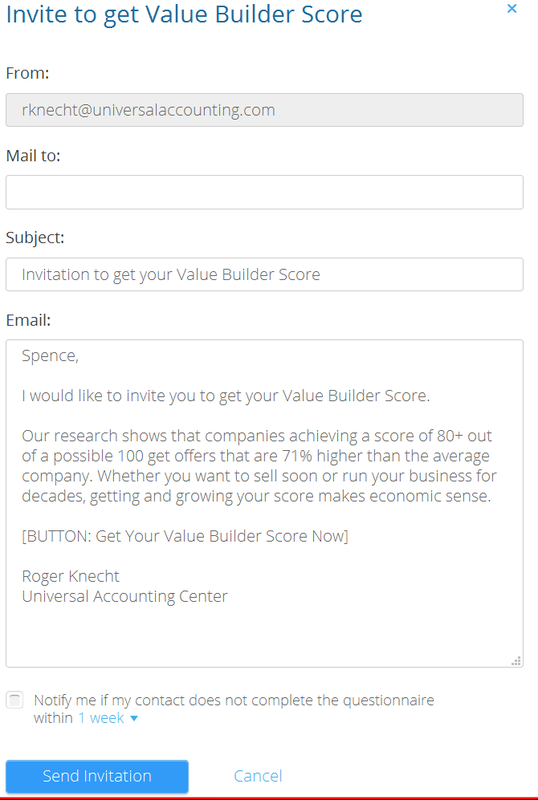 You have access to articles that you can share to spread the word about how using the value builder system will help local businesses increase their value. As you prepare your website or emails you will have easy access to logos, signatures, graphics and videos to give your media the professional appearance to back the professional credentials you have received. You will have access to pre-scripted brochures and templates for the materials you will be using with your clients to be able to provide them a sample of what they will see as they enlist your expertise in strengthening their position as an owner to one day sell their business. 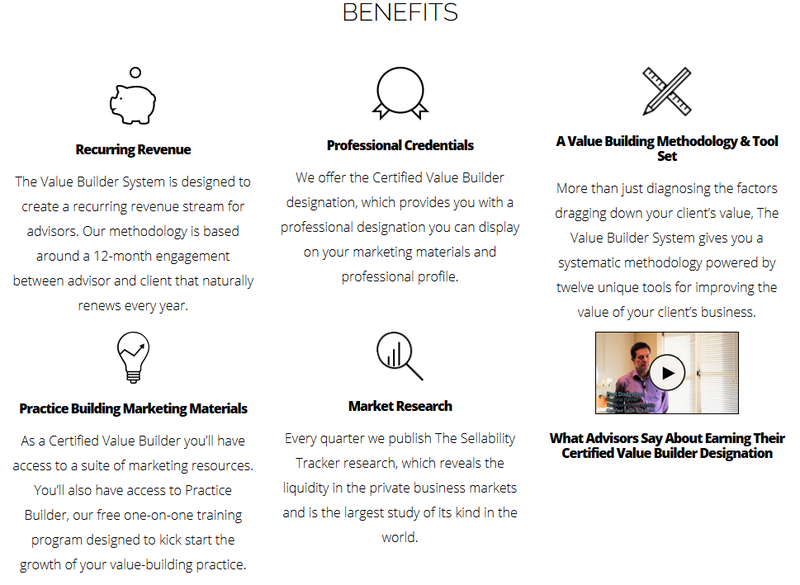 This is merely a brief overview of all the resources you will have at your fingertips when you become a Certified Value Builder Advisor. 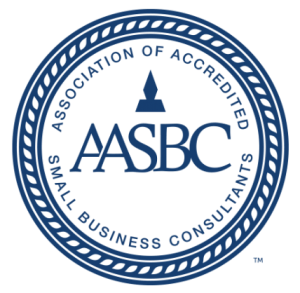 To ask questions or find out how you can get started in the meaningful and rewarding work of business consulting and advising, please contact us at 1 (877) 833-7909 or apply online here. Because of all your good training, I now have two clients and am working on a third before I’ve even sent out my letters. I just took your advice to contact firms in the paper who needed bookkeepers and used my resume to get in the door.